They say things get better with age, right? Well, this month’s issue may well be the best yet, and it’s just one issue shy of NZV8’s tenth birthday. Think of it as a delectable entrée to the main course filet mignon that will be next month’s tenth-birthday issue of NZV8. For starters, we get up close with the latest of Matamata Panelworks’ show-stopping creations — a 1965 Ford Mustang fastback — into which thousands of hours of custom work have been poured to create the stunning masterpiece you see here. To find out more about the car, you’ll have to pick up a copy, but believe us when we say it is one of the finest cars we’ve ever had the pleasure of featuring. Of course, we can appreciate that this sample of finely crafted Mustang perfection won’t appeal to all palates — let Francis Noble’s super-tough Holden HZ ute cater for the hairy-chested amongst you. Boasting a GM 572ci crate motor, topped by a BDS 8–71 supercharger, the largest tubs this side of King Henry VIII’s bathroom, and the finest shade of West Auckland matte-black paint, this street-legal tyre shredder is the final say in tough. Period. This slick 1950 Mercury is not only a marvellous example of ’60s kustom culture, it also happens to be the giveaway car at Repco Beach Hop 15. That means that you — yes, you — could be driving it home from Beach Hop. Get reading, and start dreaming — it might be time to dust off that lucky rabbit’s foot, and start crossing those fingers. 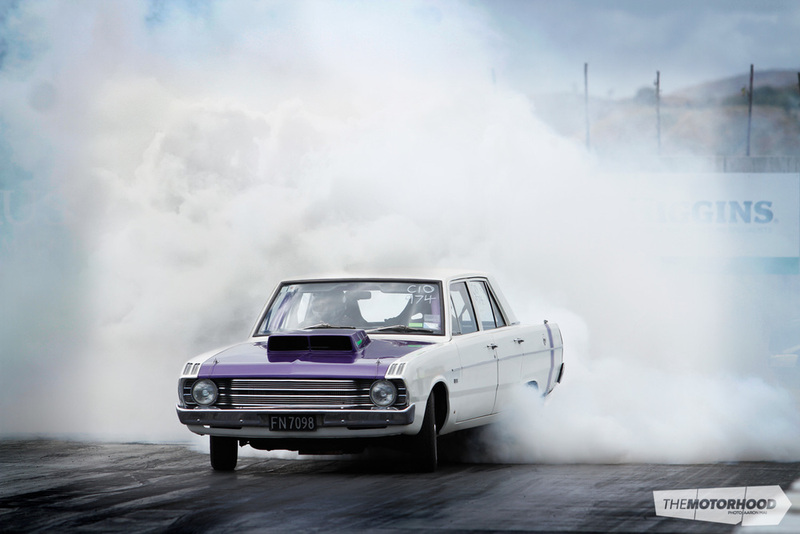 The feature-car selection is rounded off with a smooth line-up, including Kathryn McDonald’s 1969 Valiant VF — a street-legal dragster that could run a 10-second quarter mile on the school run! We’ve also got a sweet hot rod, in the form of a 1937 Chevrolet Coupe, and Inky Tulloch’s wild GT3-spec Camaro, purpose-built to destroy lap times across the globe. In case you weren’t able to make the trek down to the Taranaki to check out Americarna 2015, we did the hard work for you — pick up a copy to soak up all the very best that Americarna had to offer. Muscle Car Madness is another big one, as this year marked the 25th anniversary of the event — it may as well be a public holiday down in Canterbury! We were there to check out the crazy cars and happenings that such an event has to offer, and once again, were not disappointed. The race-heads are also treated to a full event report on round four of the Central Muscle Cars series, held at the Highlands Festival of Speed. Featuring competition from across the ditch, in the form of Australian Touring Car Masters, this round was most definitely a season highlight. All the tasty special features are there too. We’ve got the scoop on drag racing in the Middle East — the drag-racing scene in their part of the world is something else, and has to be seen to be believed! Legendary engine-builder David Vizard is back at it, and this time he’s got an article on flow-bench testing, and how to extract every last drop of power from your cylinder heads. We also look into ethanol and how it’s produced in little old New Zealand, and take a peek into a shed that would do any petrolhead proud — anything with a ’50s American diner in it is good in our books! NZV8 Issue No. 119 — on sale for only $9.99, or online at giveamag.co.nz, pick a copy up and treat yourself — it’s well worth it.